Distinguishing Characteristics Caucasian male. Brown hair, blue eyes. Akins may have a goatee or may be unshaven. He has multiple tattoos, including the word "SHORTY" and a cross on his upper arm, tattoos covering his back, both his arms and the backs of his hands, and tattoos on the right side of his neck, his abdomen and his chest. Photos of some of his tattoos are posted with this case summary. Akins goes by his middle name, Paul. 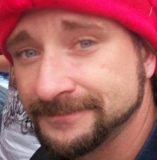 Akins was last seen in Columbus, Georgia on January 7, 2013. On January 1, he left his sister's home to visit his girlfriend 35 miles away in Buena Vista, Georgia. His girlfriend's stepfather stated he gave Akins a ride back to Columbus on January 7 and dropped him off near his residence at Elon Subdivision. He apparently never arrived home and has never been heard from again. Akins left his wallet and most of his belongings behind, but his cellular phone went missing with him and was never found. The last known communication from the phone took place in Marion County, the county where his girlfriend lives. Akins didn't have a vehicle at the time of his disappearance. His case remains unsolved. Updated 1 time since October 12, 2004. Last updated November 13, 2017; casefile added.